Last month, there was all kinds of chatter on the Internet about Marie Kondo's book, The Life-Changing Magic of Tidying Up when word went around that she suggested throwing out books. The conversations were quite funny. Novelist Elinor Lipman anticipates what could happen if someone throws out the wrong item. Nothing is private and sacred in today's world of social media and podcasts, as Daphne Maritch learns, and regrets, in Good Riddance. A year after her mother's death, Daphne is following the advice in a book, and cleaning her tiny Manhattan apartment. Although she inherited a yearbook from her mother, it doesn't bring her any joy, and she puts it in recycling. Why would a thirty-year-old divorced woman want a yearbook her mother cherished from the Pickering High School class of 1968? That class dedicated the yearbook to their teacher and advisor, June Winter Maritch. And, their teacher attended their class reunions, from their fifth to their 45th, and wrote sometimes snarky comments on pictures. To Daphne, it's trash. To Geneva Wisenkorn, one of Daphne's neighbors, that yearbook is a treasure. Geneva wants to know the truth behind the yearbook. What happened to those classmates? And, why was their former teacher obsessed enough with them to attend reunions every five years? Daphne recognizes her mistake as soon as Geneva contacts her, and wants the yearbook back. She sees it as an invasion of privacy, and intrusion on her family and the lives of fellow residents of her hometown. Geneva sees it as source material for a documentary film. And, she's sure Daphne's mother had a reason to stay in touch with that class. Good Riddance doesn't sound like a romantic comedy, does it? Believe me, Daphne has all kinds of issues in her life right now. Her short-lived marriage was a failure. Her father moves to New York City because he always wanted to live there. With Geneva's project, Daphne turns to a neighbor across the hall for advice and help, an actor who plays a teen in a popular TV show. Although the yearbook appears to be a tool for disaster in Daphne's view, the people in her life may save her from killing Geneva. It's not a light, frothy romantic comedy. It's the story of a woman's life turned upside down, and the people who are there for her. As in The Inn at Lake Devine, one of my favorites, and, as in so many of her other books, Lipman takes one simple device as a linchpin for a story that has the potential to spin out of control. Instead, she always points out the humor in life. Lipman is able to take a story just to the point of outrageous before she brings it back to the mistakes we make as ordinary people. 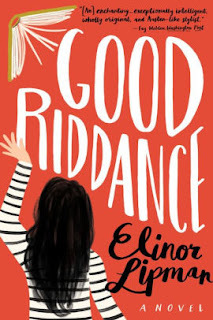 Good Riddance is another one of her delightful stories. Elinor Lipman writes social satire with heart. Good Riddance by Elinor Lipman. Houghton Mifflin Harcourt, 2019. ISBN 9780544808256 (hardcover), 290p. oooooh - I can't wait to read this. I adore Elinor Lipman. I do, too, Kaye. I think you'll find this book fun. Thanks for the review. I put it on my library list. It's a fun book, Gram. Had this on hold at the library, and I just picked it up, so I'm glad to hear you enjoyed it, Lesa. I'll look forward to hearing your opinion one of these Thursdays, Margie!